Lemon Pepper Shrimp Scampi | Time to Cook! My goal is to serve seafood once (or even twice) a week, but it requires me to get to Whole Foods or the fish market the day of … and life seems to get in the way of that. I do think extra large raw frozen shrimp is great to have on hand for a last-minute dinner. After all, many times when I buy raw shrimp, it’s already been previously frozen anyway. I simply defrost it in a bowl filled with slightly cool water in the sink, peel and devein it … and I’m ready for our recipe! This one is nice and simple and tastes great. 1. Cook orzo according to package directions, omitting salt and fat. Drain. Place orzo in a medium bowl. Stir in parsley, 1/2 teaspoon salt, and olive oil; cover and keep warm. 2. While orzo cooks, melt 1 tablespoon butter in a large nonstick skillet over medium-high heat. Sprinkle shrimp with remaining 1/4 teaspoon salt. Add half of shrimp to pan; sauté 2 minutes or until almost done. Transfer shrimp to a plate. Melt 1 teaspoon butter in pan. Add remaining shrimp to pan; sauté 2 minutes or until almost done. Transfer to plate. 3. Melt remaining 1 tablespoon butter in pan. Add garlic to pan; cook 30 seconds, stirring constantly. Stir in shrimp, juice, and pepper; cook 1 minute or until shrimp are done. 4. 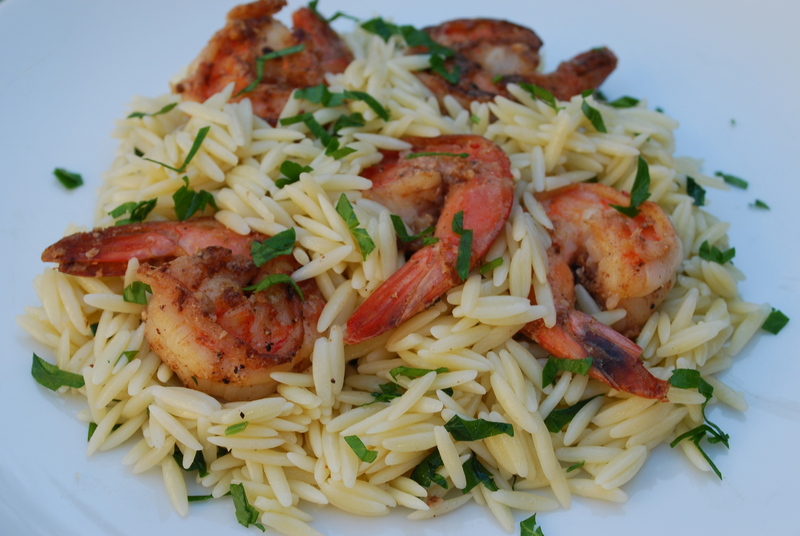 Toss shrimp and butter-lemon sauce with orzo and serve.